Forgive me readers, but I haven’t been posting much as of late due to a number of reasons. However, I do just want to highlight here that I’ll shortly be journeying to the United States of America to present at the Society of American Archaeologists 80th Annual Meeting in San Francisco, which runs from the 15th to the 19th of April. I’ll be taking part in a morning session on the Bioarchaeology of Care methodology, as proposed by Lorna Tilley (see a previous interview from 213 on this site here), on investigating and researching care-giving for physically impaired individuals in the archaeological record. 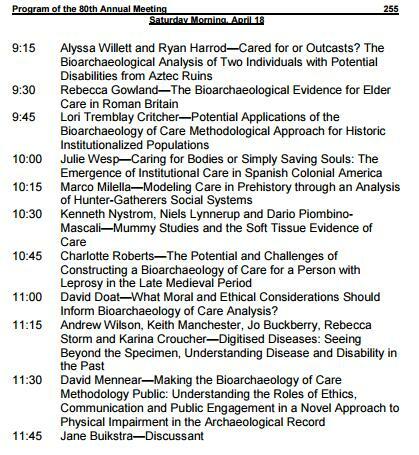 The session, entitled Building a Bioarchaeology of Care (Symposium 299), runs from 8 am until midday on the Saturday 18th at Plaza B at the Hilton hotel and conference centre in San Francisco. I’ll be talking about public engagement and outreach surrounding the methodology, and the importance of this, at 11.30 am on the day. There is a whole heap of amazing-sounding presentations before mine (see below) – I’m pretty excited to be learning about the application of the Bioarchaeology of Care methodology and associated online Index of Care program to the archaeological record itself. No pressure. Unlike a lot of the excellent researchers presenting in this session who’ll be focusing on actual archaeological sites and individuals, I’ll be talking about my experience of blogging and public communication, and the importance therein. Read the full SAA 15 program here. So, if you are visiting the City to attend the conference and the session, feel free to say hi. I’ll be the guy who’ll be chewing his fingers off with nerves! I really cannot thank the organizers of the annual meeting and, of course the session organizers, Lorna Tilley, Debra Martin and Alecia Shrenk, for their invite to take part in this session – I am thoroughly looking forward to it (but not to the hills of San Francisco!). To learn about Bioarchaeology of Care methodology head to the free-to-use Index of Care site. The Index of Care is the associated online research program to the methodology. It allows users to ‘think through’ the four different stages of the approach using the appropriate archaeological evidence to identify relevant aspects of care-giving in individual case studies. A brief introduction to the four stages of the Bioarchaeology of Care can be found here. Tilley, L. and Oxenham, M.F. 2011. Survival Against the Odds: Modeling the Social Implications of Care Provision to Seriously Disabled Individuals. International Journal of Palaeopathology 1: 35-42. (Open Access). Tilley, L. 2015. Accommodating Difference in the Prehistoric Past: Revisiting the Case of Romito 2 from a Bioarchaeology of Care Perspective. International Journey of Palaeopathology. 8: 64-74. (Open Access). Bioarchaeology of care is a Nurse’s dream come true. Finally, it is being addressed! I am a Nurse who is studying bioarchaeology.